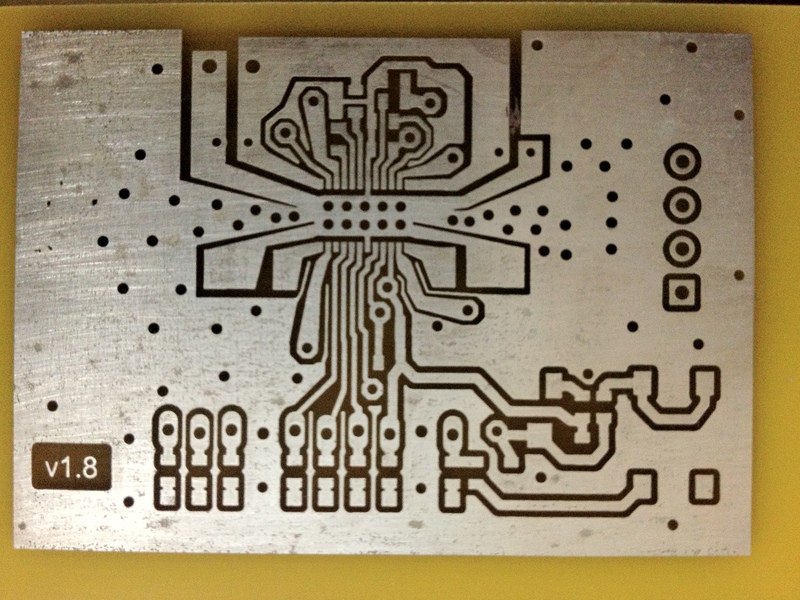 The Toner Transfer method utilizes a laser printer to create the etching mask for a PCB. The laser toner is made of plastic, which when laminated to the copper PCB creates the acid-resist mask. This method is good for producing low volume/prototype boards. Variations of this method have been described many times online. I’m adding my 2 cents as I have worked out the wrinkles and I get perfect results every time. Traces and spaces of 10 mils are no problem. I have tried many toner transfer methods including using an Iron to laminate (ugh! ), using magazine paper, different ways of cleaning the board… I am not trying to describe the cheapest method, I just want something that works perfectly every time without messing around! The most critical elements are: having a good transfer paper, a good laminator ($43), and a properly prepared PCB. Without all of these it will be hit and miss! A laser printer (I’m just using an old HP Laserjet 1000). HP toner has been reported to be superior. Dextrin coated transfer paper (buy “Press-n-Peel Blue Transfer Film” or make it) After laminating, the transfer paper must separate effortlessly from the toner or you will loose fine traces! A laminator. I’m using a GBC HeatSeal H212 Pouch Laminator that I got for $43 with shipping from buy.com. I removed the aluminum guides and plastic fingers from the exit path so PCBs go through it easily. This was easily done by removing the cover and just unscrewing the extra stuff. That shouldn’t take more than 5 minutes to do with just a screwdriver. Laser Foil. This can be purchased generically from Amazon.com, etc, but I find the green “Toner Reactive Foil” from Pulsar (also known as Green TRF) is better and at $8.95 about the same price or even cheaper, and it’s top surface does not flake off in the etchant. The generic stuff works for me so I’m using it up, but next time I will order it from Pulsar. Glossy Magazine paper – I got very inconsistent results – the paper has to be glossy enough to not allow the toner to bond with the fibers – otherwise when you try to get it off the PCB it will take traces with it. Also magazine paper is horrible to use for double sided boards with all the printing on it. Ugh! Staples glossy photo paper – it has a plastic layer that sticks to the copper. HP Brochure Paper 150G #Q6611A– it sticks badly. It has a very fine surface however, so I used it for my Dextrin coated paper. Press-n-Peel. This works very well, however the blue paper is so opaque/dark that it is very difficult to align double sided boards. If you use a very bright light then this is OK. It does float off very easily indeed. Buying this will save you time, so if you don’t like doing everything yourself then buy it! I prefer making my own dextrin coated paper however. Note: if you choose to do this you do so at your own risk – you will be putting tape through your printer – I will not be held responsible for any damages. Turn off everything except Top, Pads, Vias and click OK. Choose a file name, click Monochrome, Resolution 1200 dpi and click OK. It’s a good idea to have the resolution that high to reduce jaggies, and your printer may smooth things better than you think. Fine traces will only be a couple pixels wide otherwise. Do steps 1-4 again except choose Bottom, Pads, Vias. Export the same way except with a different name. 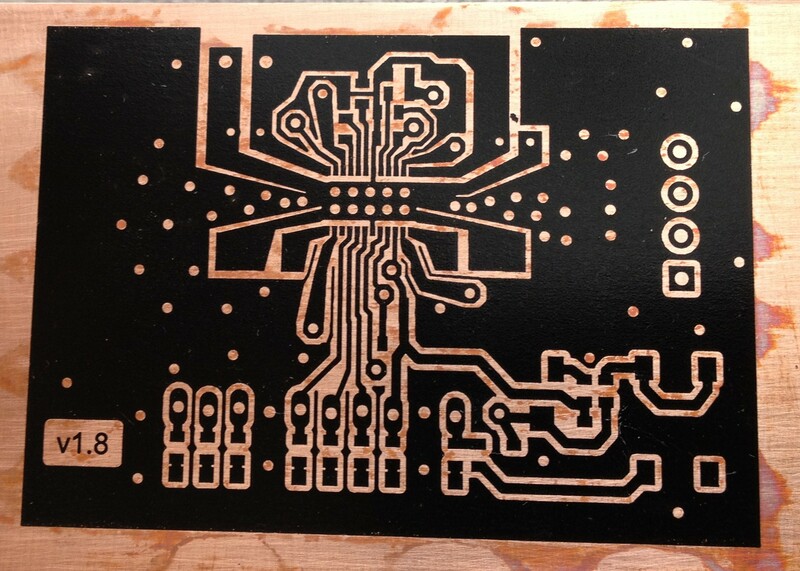 Print out your PCB design on a sheet of plain paper using your laser printer (only a laser printer will work). On an HP printer you may have the option to print on Rough paper, econo-mode off, REt (resolution enhancement) on. “Rough paper” may use more toner (a good thing). Use the fold-out tray if your printer has one. Note the orientation of the page as it is pulled into the printer. Put an X near one end before printing if you need to be sure of it. It will help a lot to have the image near the bottom of the page. 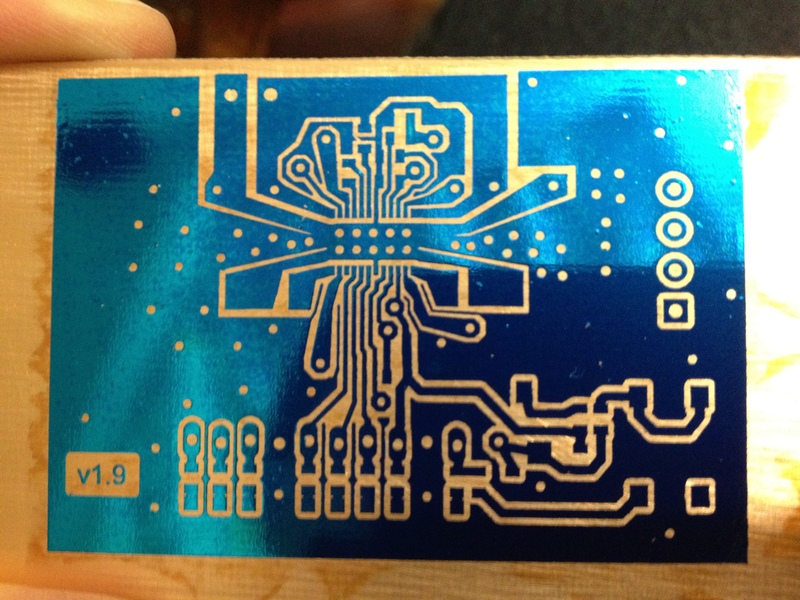 Make sure now that you mirrored the image for the top of the PCB! Just open it in Gimp and choose Tools, Transform Tools, Flip. Then save it. If you have not already done so: place each part type on the printed image and make sure they align with the pads! Make sure thru-hole parts match the pitch also. Someone has recommended printing a rectangle around the outside of your design that will help hold the transfer paper in place while laminating (I’m sorry I have forgotten where I read this). This might be worth doing if you don’t have a filled ground plane. Cut a bit of dextrin transfer paper at least 2 inches bigger than your design. (For single sided boards this is not important). Align the transfer paper over the image that was printed on the plain paper with the dextrin side out. Make sure there will be an inch (or more) space above and to the sides. Tape the transfer paper along the “top” edge (the edge that will be drawn into the printer first). I used blue painters tape or masking tape. A bit of curling of the dextrin paper does not matter if the image is near the bottom of the page. Place the page back into the printer in the same orientation noted earlier. Print your mask. Repeat for the bottom side mask (if any), note that the image for the bottom does not need to be mirrored. Place the two masks face to face and hold up to a bright light. Carefully align the holes. You may find that some of the image aligns perfectly, and other parts are slightly off. This is normal as laser printers do not always print perfectly evenly. Align them the best you can… next time you will make your via’s bigger, right? 🙂 I use larger than normal vias (0.066 in) with smaller holes in Eagle, so slight alignment issues do not matter a bit. When aligned, tape the top edge with masking tape. You want this edge to be at least ½ inch away from the edge of the image so you do not have any issues later. Cut the bottom and one side edge of the mask a short distance from the image, say 1/8 of an inch. Use a paper cutter, and make sure the cuts are strait and square. (You can hold the image up to the light to determine where the edge of the image is and draw a couple lines on the outside of the paper). Make sure the last edge is trimmed even, but keep that edge at least ½ inch away from the image, and fold a piece of tape over this side. Now it’s taped on two sides like a partial envelope so it can not shift easily and is ready to laminate. Do not skip any steps! Turn on the laminator so it’s heating. Cut the PCB a bit larger than needed. Make sure the edges of the PCB are not sharp, I touch them up on a bench grinder or use a file. Put your latex/rubber gloves on and keep them on for this entire process. Pre-clean the PCB with alcohol and a bit of paper towel. Sand very lightly with 400 or 600 grit “wet-dry” sandpaper in one direction until there are even sanding marks over the entire board. This removes the oxidation, and creates a perfect surface texture for the toner to bond to. Do not use water. Turn 90 degrees and repeat, there should be an even pattern of sanding marks. Do this for the 2nd side if you are doing a 2 sided board. Clean the board with 90%+ alcohol twice, until the paper towel comes off clean and allow to air dry. Sandwich the PCB in plain white printer paper and run through the laminator until quite hot to remove any moisture which could cause pinholes in the toner. You should still be wearing your gloves. (Do not use paper towel for this, it can leave a residue. I observed this as a pattern on a tinned board). Note: some folks use a green scrubby pad or cleanser to clean the copper. I do not think that works as well as that can burnish the surface and make it harder for the toner to stick! Shiny and polished = not good. I have had some tiny traces fall off that way. The sandpaper method is just as fast, produces a grippy surface, and does not saturate the copper pores with water. It’s much more reliable! The laminator should be on and hot. You have your gloves on, right? Take the still very warm (but not hot) board and place it inside the envelope of the masks. If single sided, just place the mask on top. Align the cut edges to the PCB using a table top. This is the time to make sure both sides are aligned perfectly with the edges of the PCB. The two taped edges of the mask envelope should be at least ½ inch away from the PCB so they stay strait and do not put a torque on the paper by trying to fold. Holding the mask tightly, run the PCB sandwich through the laminator repeatedly until it reaches at least 220 degrees F (I just run mine through 8 or 10 times (less if preheated) since I know it will reach that temp by then – I measured with one of those laser temp meters). If your laminator is too hot it can spread out the traces (mine doesn’t so more passes does not hurt). If your laminator is too hot then use less passes. Allow the PCB to cool a bit, then place in warm/hot tap water and soak for 10 minutes. Don’t get hasty! After 10 minutes the Dextrin will dissolve and cause the paper to come off cleanly, or even float off – without any force, leaving perfect traces behind. If you jump the gun you defeat the purpose and may pull off small traces. You do not need to use soap in the water. Press-n-Peel will come off even faster – in perhaps 1 minute. No force required, no peeling, no scrubbing – just a perfect image that will be well adhered. Rinse the board in hot water for one minute (still using your gloves) and brush lightly with just a cotton ball – very lightly as you do not want to disturb a trace at this stage! You are just removing any dextrin residue. Inspect carefully for any scratches or missing traces. This should only happen if you were careless in the above step. If there are any, then clean the board with acetone, sandpaper and re-laminate! Use a hair drier to dry the PCB completely before the next step. (Gloves still on so no fingerprints…). You may see some slight oxidization but it will not matter. This prevents pinholes, and strengthens the mask so the etchant does not degrade it. It makes a big difference. Cut pieces of laser foil to the size of your board. Hold the laser film(s) taut to help eliminate wrinkles, run through the laminator once or twice. Allow to cool and peel off the outer film layer. The inside layer of the laser film will remain bonded to wherever there was toner. Some small holes etc may not come off with the film – just use a bit of blue painter’s tape or other tape wrapped around your finger sticky side out to remove these bits from the board. Inspect with a magnifier to make sure you got them all. You can use plastic adhesive shelf paper to cover any place you do not want etched – on later versions of this board I covered the outside areas as the entire board is a heatsink for the A3987 stepper driver chip. This is an example of the laser foil that can be purchased through Amazon. You will notice that there is a slight flaw in it at the top because I pulled the paper off at 5 minutes rather than waiting the full 10 minutes. The dextrin paper should get wrinkly and basically float off. A small stuck on spot can concentrate forces, small traces don’t stand a chance.. I was able to cut a thin slice of shelf paper (made of plastic, with a sticky side) and use that to repair the spot before etching. I find that a sharpie marker does not work with my etchant. On later versions I also reduced the drill size to the smallest size so slight registration issues don’t matter much. This is an earlier version of my A3987 Stepper Driver board (50v, 1.5A) after tinning. The pads on the chip have about 10 mil spacing. This version had inputs for all the chip functions, with status LEDs for each. This was a double copper thickness (2 oz), double sided board. Nowadays I would insert the via rivets and then tin the board. Soldering iron with adjustable heat (set to approx 600 degrees F). A good magnifier with a ring light. This one has a good clear lens and is inexpensive. It doesn’t always stay put as still as I would like, but overall is a good one. Use Acetone to remove the toner resist. It works much better than alcohol. Drill any holes. Make sure they are large enough before assembly. Insert any Via rivets (I wrote about that here). Clean with alcohol and/or a green scrubby pad, rinse, dry (use gloves). It must be absolutely clean and shiny for the next step. Plate with Liquid Tin (optional) to protect the copper and make soldering easier, or apply coat of flux with a flux pen. Print out a placement diagram with part values, and the Bill of Materials. Apply solder paste with a hypodermic (except for fine pin chips), just a dot in each location. You can always add solder later, but too much is a mess. Clean up any mistakes with a q-tip. Place any SMT parts using tweezers, using your magnifier light, and your best reading glasses (as needed…). I like to place the smallest parts first. BTW: I purchased some extra strong reading glasses based on my prescription from ZenniOptical, and they only cost about $15.00 with shipping! Inspect! Nudge any parts that need it. Place the board in an electric skillet, then turn it up to 350 degrees F.
Wait a few minutes for the solder to reflow, turn off the heat when it’s done, allow to cool. Solder any fine pins. I use a flux pen first. Place the solder across the pins, then bring the soldering tip down on the solder. As soon as it reflows – wipe the soldering tip sideways directly away from the chip body to easily remove any excess solder (the solder will follow the heat of the tip), or use solder wick. I set my iron for 600 degrees and do not leave it in place long. Be careful not to overheat the part (feel it)! I find this much easier than trying to apply solder paste to pads that are 10 mils apart! Remove any rosin flux with alcohol, a fine brush & paper towel. Carefully inspect with a magnifier for any shifted parts, solder bridges, etc. Use an ohm meter to test any suspect traces. just wondering what currently manufactured laminator you might recommend since GBC no longer supplies the HeatSeal H212 ? The HeatSeal H212 is still available on Overstock.com and other places. I looked at the Swingline GBC Fusion 1100L 9-Inch Laminator – it has a strait path and so may work. Let me know if you try it! Sure would have been nice to get a $43 price though. Too bad it’s more expensive. I’m sure that will save some folks a headache. Please let me know how it works for you. I have the GBC HeatSeal H212 and can tell you that thing is garbage don’t even waste your money on that the best one’s I’ve tried are the Apache AL13P and the GBC H-220. I have modded the Apache AL13P to do single pass, baking parchment transfers at only 300F setting…no burnt tape, no smoking! Just a plug in ‘feature’ PCB with several additional functions. 10 mil repeatable detail & spacing with 1 oz copper! Have a look, the mod is fully reversible!